Wooden Jewelry makes a great gift, and can be a quick and inexpensive project for the weekend woodworker, and also a great way to use up those interesting scraps of wood. Great pieces of wooden jewelry display and accentuates the natural beauty of the wood it is from. Because of this the best wooden jewelry need to be made from the most interesting and striking woods. For most woodwork, uniformity is required, but for jewelry it is interest, burls, bright colors, extreme grain, spalting that are all important. Selection of the wood to use is ninety percent of the craft, paying attention to grain pattern and color, the beauty of the wood really is all in making great jewelry. For most of my work I use spalted birch, and spalted oak. Most of the wood I use is gatherd from the forest, as windfall branches, or the odd spalted oak stump. Also scraps of exotic woods or even laminated scraps of veneercan be excellent. Once you have selected your wood, you need to cut and shape it. The design for my jewelry is normally suggested by the wood itself, I may leave a piece of wood laying around the workshop until I get inspiration, the interaction of grain and shape or the color. Once your decided on the design shaping is a simple if mechanical process of cutting, filling and sanding using scroll saws, files, rasps and sand paper. Because of the small size of wooden jewelry it will be viewed close up, it needs a really smooth finish, so sanding is carried out with many finer and finer grits of paper, usually down to 1000 -1200 grit. This part of the process can be fiddly, I often end up sanding more off the ends of my fingers than the work itself! I normally do not use any stains or dyes as these obscure the natural beauty of the underlying wood. The main finishes I use for wooden jewelry are tung oil, shellack, bees wax and clear lacquer. Each have their own merits and faults, you need to experiment to get the look your after. Most often I go for a high gloss finish as this really shows the beauty of the wood. Once the woodworking is done you need to add the metal fittings ear-hooks, chains, pins, beads and straps. Chose these with care, some pieces will look better with gold some with silver or copper. Often a piece will be accentuated with a bead or two. The fittings I usually attach with epoxy resin, other glues I have tried tended to fail for one reason or other. 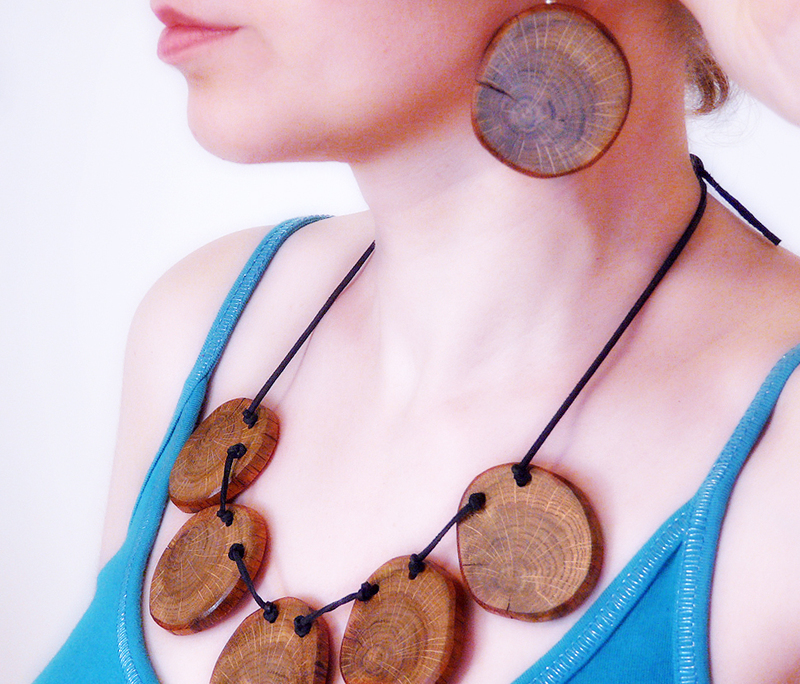 I hope this article has given you some insights in to the making of wooden jewelry. If you are inspired to make some wooden jewelry, send us a photo, and I'll post it here.